Hey guys, weirdest thing... im trying to log in on daoc portal and when ever i try to load the portal (server list screen) i get a error message... i will display before and im a noob so i dont know how/what fix im looking for ..it said somthing bout fraim work?? anyway i dunno any help GREATLY appriciated. Seems this was a dol server issue looks like they reset every days so at 00:00 was working again. going to leave this post incase it helps any one else. When Daoc Portal server is down the program gives a error. You can make a direct shortcut to connect directly even if DaocPortal is down. 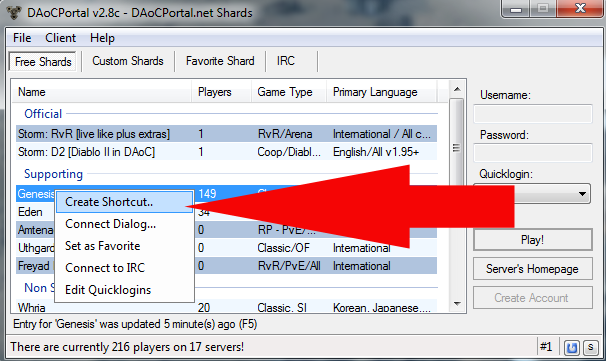 Or when Portal is running fine, right click above Genesis server and click "Create Shortcut"
Now you have a shortcut in your desktop.You can connect to Genesis with it even if Daoc portal is down. TY! ( Can we have some sort of point system in the forum!? ) i wana give gorman some for helpfullness! +2.2!